From cute little drawings of dolphins to terrors of the deep, the sea-life images on Reusable Art offer a little something for everyone. We have landscape-style drawings of the ocean floor, simple line drawings to full-color botanical prints featuring a variety of sea-swelling creatures. And, when a creature moves on to a new home, they often leave behind their old one. Those old homes are the beautiful shells so many of us treasure from our visits to the beach. 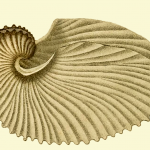 Drawings of shells can also be found here. He looks a bit like a cartoon villian but this vintage sea scorpion drawing depicts a now extinct species of sea creatures. 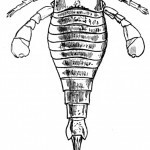 Pair of trilobite drawings from 1910. 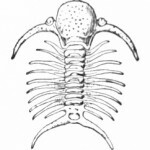 They show the fossilized remains of a Triarthrus from both the top and bottom. Way cool! 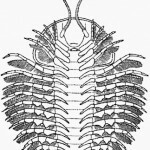 For a fossil, I think this is one cute trilobite drawing. To me, I think he looks a bit like a smiling monster with a pari of little eyes and a big smile. 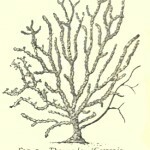 Lovely black and white sea fan drawing. This coral looks quite a bit like a tree. I think it would work great as a tree or as a nautical element too. 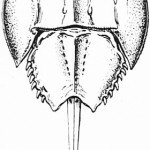 Vintage horseshoe crab drawing from 1910. Black and white drawing of these living fossils found along the Atlantic Coast of the United States. Who knew that some octopi had hard shells? I didn’t before I found this great vintage octopus shell drawing from an argonauta argo octopus. 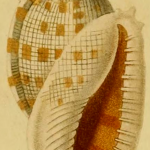 This white and yellow shell drawing features a checkerboard-like grid with yellow squares in random places and a bright peach and red mouth. Beautiful book plate from an 1822 natural history dictionary. 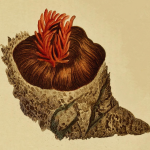 Red, copper, brown and green colors adorn this public domain sea anemone drawing. 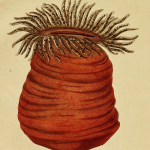 Book plate from 1822 with an orange sea anemone drawing. Beautiful orange color with tendrils like leopard spots. Medusa Rhizostoma looks a bit like a monster from outer space. It’s not. 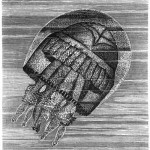 This jellyfish drawing simply depicts one of the largest of these creatures. 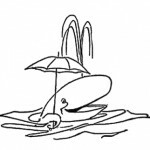 Whimsical drawing of a happy whale with an umbrella. Can you find the whale in this picture? 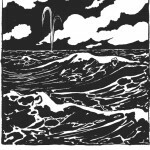 Fun, vintage drawing of a hiding whale in the sea.